By Prof. Cathy Macharis — director, VUB MOBI Mobility, Logistics and Automotive Technology Research Centre & Dr. Imre Keseru — team leader — urban mobility, VUB MOBI Mobility, Logistics and Automotive Technology Research Centre. The evaluation of various scenarios that depict possible future developments for the mobility of Europe in 2030 is one of the key elements of the Mobility4EU project. With the board game “Mobility is a serious game” this type of scenario thinking can be facilitated in a playful manner. The idea of the game is to explore the future (the near future but also the longer future) and take the role of one of the major players in the mobility system (government, businesses, NGOs and society). You can take actions i.e. propose measures but you must be aware of the public voice who will give comments on the way the proposed measures affect the society. The board game was co-created by 6 committed citizens in Belgium: Professor Cathy Macharis from the MOBI Research Centre of the VUB, Karin De Schepper from Inland Navigation & CleanAirBXL, Steven Vanden Brande from Durabrik, Guibert Boone from Fockedey, Miguel Vertriest from Flanders’ sustainable mobility network (Netwerk Duurzame Mobiliteit) and Koen De Maesschalck from Colruyt Group. 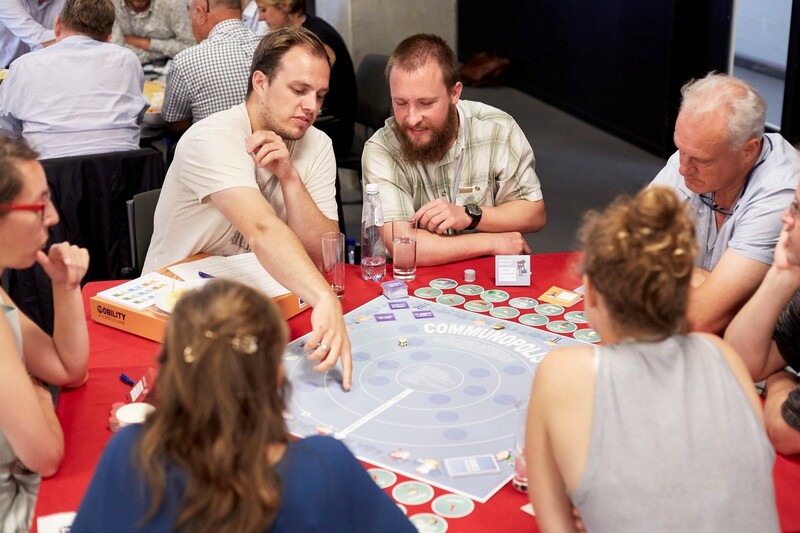 Under the guidance of Sandra Schruijer, professor of organisation science at the University of Utrecht, they concluded that a game could help us relieve our mobility problem. 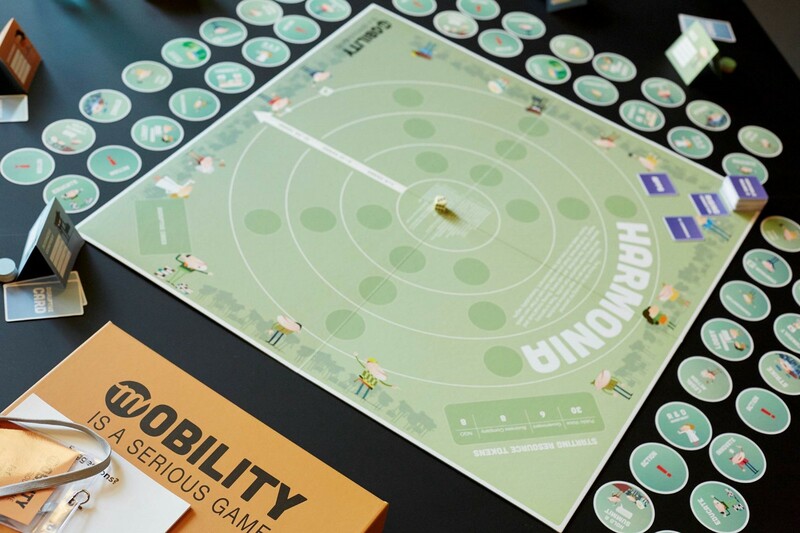 Inspired by the work of Laurent Bontoux of JRC (European Commission) they created a mobility game intended to connect people, show empathy for each other’s role and let new ideas surface. 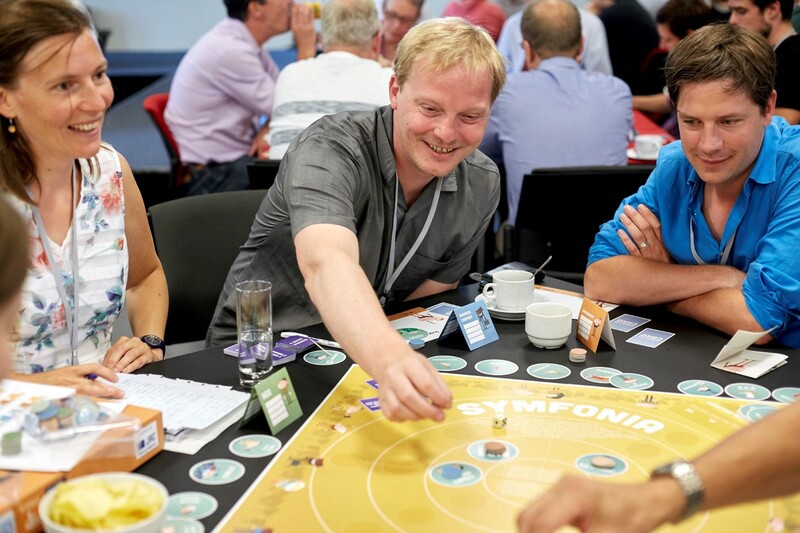 After an extensive testing round, the game was launched on 21 June 2017 at the Mobility Congress, a large scale event, attended by the Brussels Mobility Minister Pascal Smet and more than 100 participants. You can play the game in 4 worlds. They give a possible context in which you undertake actions. A world where nature, individuals and well-being are in harmony. It is small-scale and locally aimed at pursuing personal happiness. In this world, collective well-being is what it is all about and the individual experiences the added value of the collective system. Collective growth of prosperity by means of strong individual performances is the leading motive. There is fierce competition and high levels of competence. A powerful collective authority contributes to prosperity for many. The individual is subordinate. Players take the role of one of the stakeholders (governments, companies, NGOs, public voice) who propose actions to achieve their goals for three timescales (1–5 years, 5–10 years, 10–30 years). Stakeholders can ‘vote’ with tokens for the actions that they would support and they can cooperate with other stakeholders. The public voice assesses all proposed actions and decides to support one or more of them. The game can be played in the context of each of the 4 scenarios, which are each represented by a separate game board.